This summer we have the amazing opportunity to learn from an amazing cirque performer & acrobat Mishannock Bruno Ferrero! Mishan has traveled the world. “I started circus when I was about 14 years old in Sweden — 3 years of circus high school, then 3 years at the national circus school in Montreal. For the last 3 years I’ve been on tour around the world performing. In June, I start a new adventure with Cirque du Soleil . My main disciplines are hand to hand (partner acrobatics), icarien games, and banquin. We will be touching bases on a bit of all of them, learning the right alignments, techniques, and trying new things. As an all level class, we will adapt and have fun together! And some video of him in action! Send a PM to Aiyesha Ghani to reserve your spot! April 22, 2017 AcroBeach Day! Join us at Crandon Park on Key Biscayne for a FREE AcroYoga class taught by Aiyesha followed by a Jam in the Sand + Potluck. 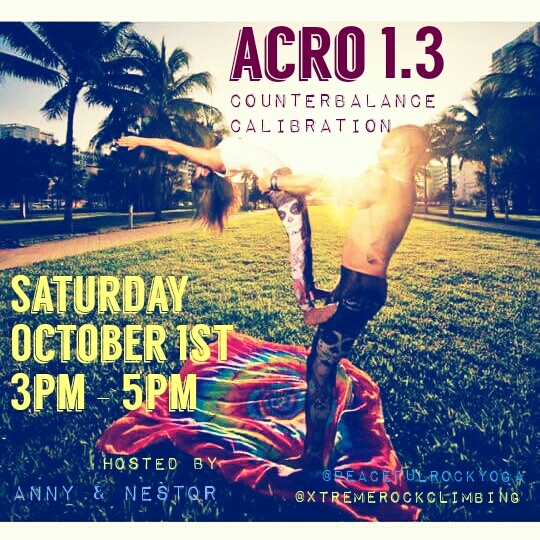 JAMbassadors, yoga instructor Anny Nottaro & her partner, Nestor Sandoval, come to Peaceful Rock on Saturday, October 1st from 3pm – 5pm to share some acro skills in calibrating for counterbalancing!